I walked out of the building this evening around sunset. 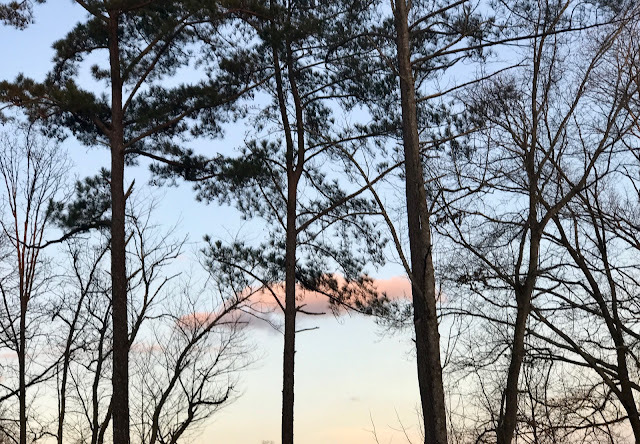 I was getting into my car when I looked through the trees and saw one cotton candy pink cloud floating in the sky. Just a couple of hours before, the sky had been grey and sad. That beautiful pink cloud was a gift. When I saw it, I laughed out loud. I hope you get a cotton candy cloud in your life too. I'm glad the cotton candy cloud brought you joy. It was up there for everyone to see. I wonder how many people even noticed it.